The Federal High Court sitting in Makurdi has asked the Economic and Financial Crimes Commission and two commercial banks to appear before it over the recent freezing of the state government’s accounts. The banks are United Bank for Africa and Fidelity Bank. In the writ of summons issued to the defendants, the court asks EFCC and the two banks to, within 30 days, state why they carried out their action of freezing Benue State Government accounts. The Economic and Financial Crimes Commission had on the 7th of August, 2018 ordered the freezing of Benue State Government’s accounts in UBA and Fidelity banks. But the accounts were later unfrozen after public outcry. Following the freezing of the accounts, the state government through the office of Attorney General and Commissioner for Justice dragged the anti-graft agency to the court demanding N30bn as damages suffered within the period of freezing the accounts. The government had among other things prayed the court to declare that EFCC acted against the law when it directed the banks to freeze its accounts. It also demanded a declaration of the court that by freezing the said accounts, EFCC denied the government the right to operate and transact on the affected accounts. The suit also sought the verdict of the court to the effect that a state government’s account maintained with any bank or financial institution in Nigeria did not fall within the class of bank accounts that can be frozen by the EFCC. 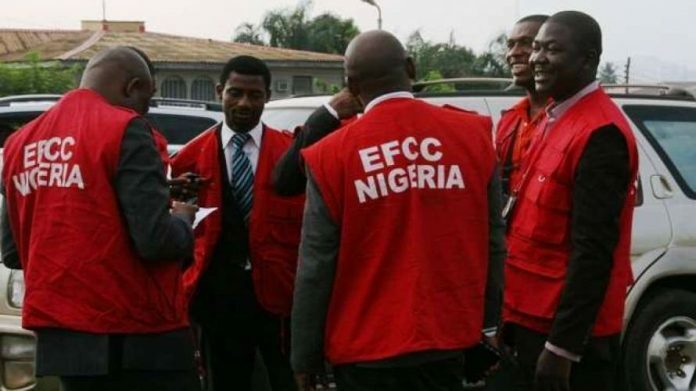 The state government also prayed the court to give an order of perpetual injunction restraining the EFCC or its agents from freezing accounts held in UBA and Fidelity Bank or any other bank. The case will come up on October 8 for hearing.